40 Years excellence in map dealing. Online Auction of antique maps, old prints, posters, atlases, globes. 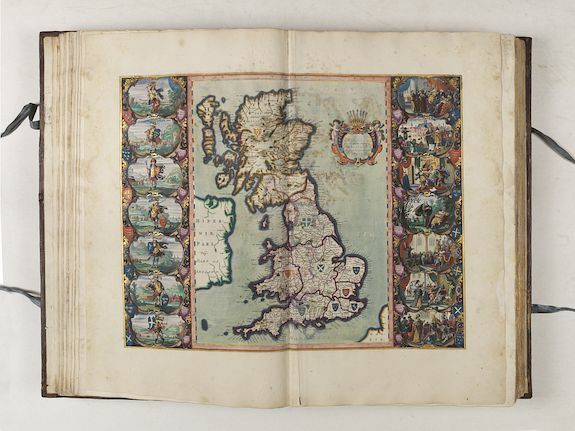 Atlas of England by Joan Blaeu. Vierde Stuck der Aerdrycks-Beschryving, welck vervat Engelandt, i.e. Theatrum Orbis Terrarum. vol 4, England & Wales..
Amsterdam, 1648. Contemporary red morocco, elaborately gold-tooled. The spine in compartments, the second showing the title of the book. Large folio (565 x 370 mm.). Dutch text, engraved title border with printed text label hand-coloured and heightened with gold, 58 engraved maps, all but one double page, also hand-coloured and heightened with gold, engraved and woodcut text-illustrations, many hand-coloured. An outstanding example of Joannes Blaeu's "Vierde Stuck der Aerdrycks-Beschryving, welck vervat Engelandt, i.e. 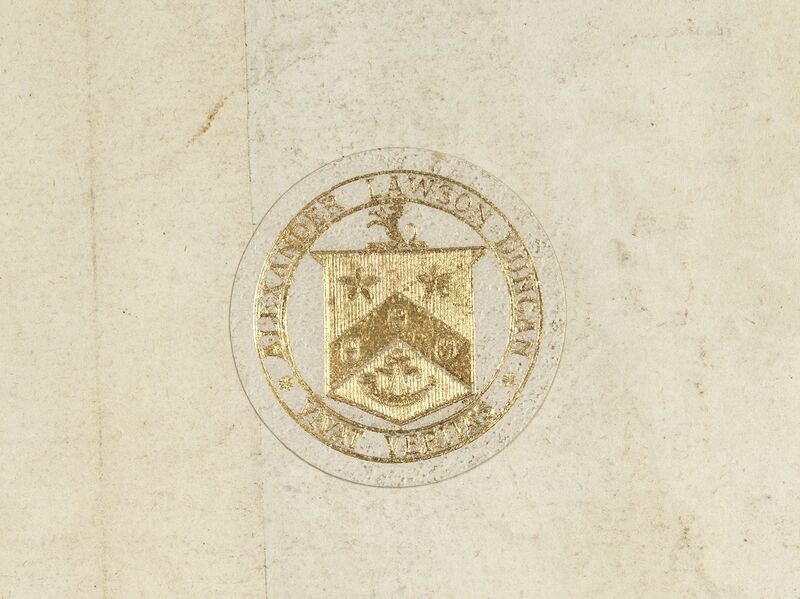 Theatrum Orbis Terrarum": being volume 4, England & Wales, with Dutch text. The engraved title border with printed text label, 58 engraved maps hand-coloured and heightened gold most probably by the master colourist Dirck Jansz. Van Santen. The binding in contemporary red morocco and attributed to Albertus Magnus or his work shop. is generally considered the most important Dutch bookbinder. Albert Magnus started making his luxury bindings around 1667. Herman de la Fontaine Verwey's pioneering research has yielded much information on Magnus's professional activities. Mirjam Foot has examined the tools of many bindings attributed to Magnus and proved that a large part of them cannot have been made by the master himself. The colouring of the maps has been attributed to the master colourist Dirk Jansz Van Santen (1637/38-1708) who worked for Kings and rich merchants. His manner is signified by rich and exotic colour combinations, added elements such as flowers to clothing, marbling to masonry. Goedings : "Van Santen applied transparent and opaque colours at the same time in both mixed and pure tints. He often painted the whole surface of the map or illustration, transforming the graphic light and dark contrasts into colour. He applied his characteristic shiny varnish, this had the effect of brightening the colour, frequently making use of the same colour progression." "Atlases and books coloured by van Santen are found in the libraries of the most prominent collectors of the golden age of Dutch cartography ". Bibles and atlases, bound in deluxe bindings by Albert Magnus (1642-1689) and decorated by van Santen were considered gifts worthy of princes. Travelers and poets wrote about this work" (Goedings). Both attributions are made by Mrs. T. Goedings, who after studing HR images adds that the volume could have been part of a Multi volume Blaeu Atlas only known in the literature. The contents of the atlas is derivided by Blaeu from various editions of John Speed’s Theatre of the Empire of Great Britain originally published in 1611. The texts derive largely from William Camden’s Britannia. Blaeu originally published this as Volume IV of the Atlas novus in 1645. Each map epitomised the craftsmanship and artistry of the Blaeu workshop being beautifully ornate with fine cartouches, heraldic shields and calligraphy. Later in 1662 the maps reappeared in volume five of his Atlas Maior, perhaps the finest cartographic work ever produced. The map of Cheshire with Spanish text on verso, and slightly smaller in size, but coloured and heightened with gold by the same hand as the other maps. Several maps with marginal tears, repaired, some paper degradation and water staining throughout, affecting both text and maps. Contemporary red morocco, elaborately gilt, with some repairs to spine and corners. Reference : van de Krogt, Atlantes Neerlandici, Vol. 2, 2:231, K.
The binder Albert Magnus and the collectors of his age in Quaerendo. Antique maps, old prints, Medieval Manuscripts, Auction and Gallery.